If you have any interest whatsoever in one of the most famous Argentines – make that women – who ever lived, then this book is highly recommended. In less than 200 pages authors Nicholas Fraser and Marysa Navarro sum up the life of a complex person driven to greatness despite her humble birth. At the same time they provide a succinct history of twentieth century Argentina. But beware, myths are dispelled. If, like millions, you held flawless visions of Eva Perón (née Duarte), the illegitimate daughter of a rancher left high and dry with her mother and siblings in a dusty rural cattle town, who went on to champion the rights of her fellow underprivileged and downtrodden Argentines, then you might just be disillusioned at the corruption and egotism that also marked much of her life. 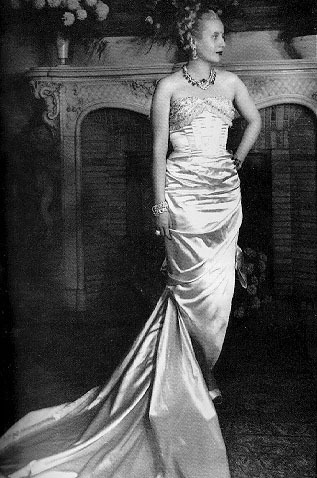 And if, like many others, you believe that Evita was little more than a stylish fascist, a shill for her husband, the infamous General Perón, pioneer of the Argentine police state of later years, and was obsessed only with bars of gold, French gowns and adulation, then you will probably be disappointed as well. 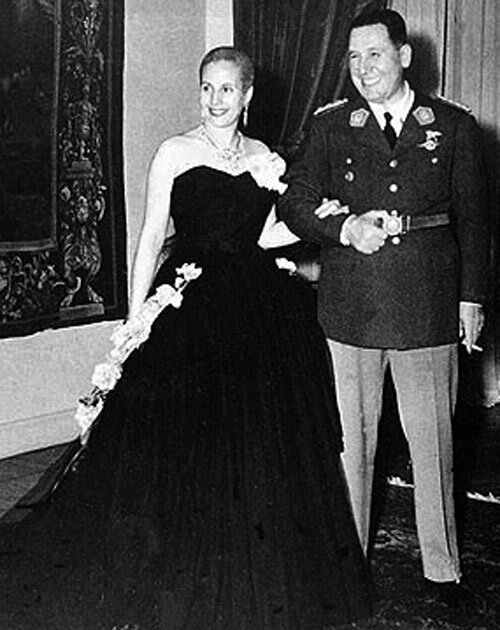 Because Eva Perón’s short life, before she died at thirty-three after a lengthy battle with ovarian cancer (ironically the same illness that would strike down Juan Perón’s first wife), was one of contradictions, demonstrated by grand gestures in the Latin style (she proposed a monument the size of a building to her beloved decamisados – the ‘shirtless’ workers who brought the Peróns to power), as well as tireless efforts to reach out to the poor, whom she never lost touch with. 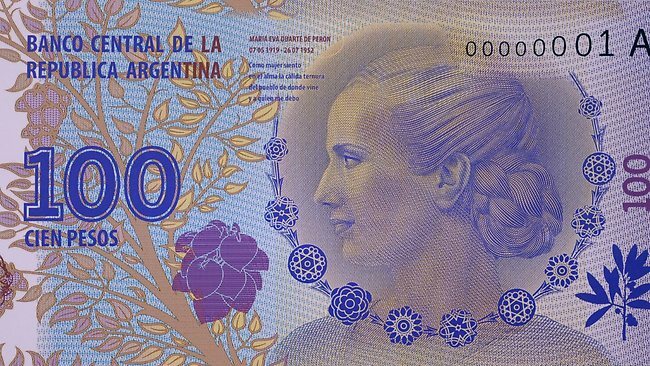 The Eva Perón Foundation, a massive charity not without its share of fraud and politicking, handed out countless fifty peso notes to anyone who lined up outside Eva’s office, and built state-of-the-art clinics and hospitals still in use today. She organized the Female Peronist Party and raised political awareness for Argentine women. She was instrumental in getting them the right to vote – an effort that would help her husband win a crucial election, despite his many enemies. 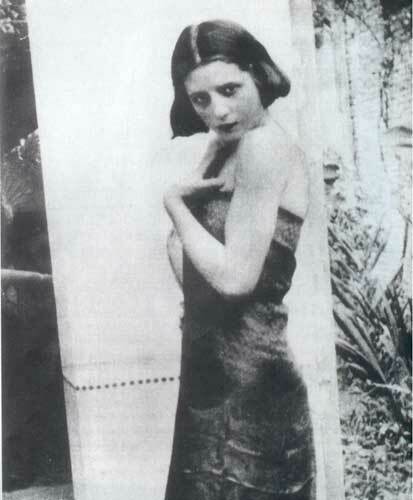 Not bad for a woman who escaped a windblown cow town with a cardboard suitcase and embarked on an acting career as a fifteen year old in 1930s Buenos Aires. Falling prey to more than one man willing to exploit her, in one instance Eva was publicly humiliated by an industry insider outside his office after she slept with him in the hopes of getting a part in a play. She didn’t get the part. And rumors of her more sordid activities to get by abound. But she kept acting. And she got better, becoming the highest paid radio actress at a time when radio was king in Argentina, and meeting the influential Juan Perón at a charity function. Even as a young starlet bent on fame she showed fervent support for charities. 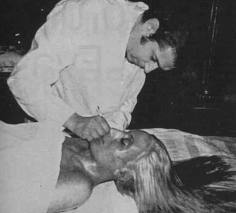 Becoming his mistress, the strong-willed Evita became Sra. Perón, when the public demanded respectability. 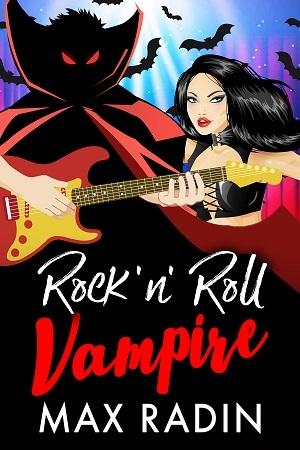 And she was arguably his better half, bringing a new look to the outdated uniforms and stiff-armed style of the classic Latin American dictator and crafting an image that would serve him well. Juan Perón soon donned Italian suits and a softer bearing as Eva became his front ‘man’, winning over a postwar world no longer enamored with fascists. 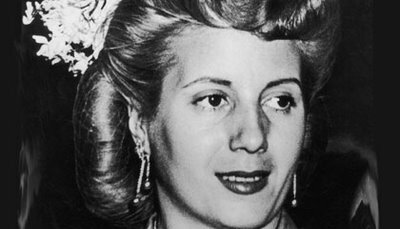 After WWII, when Juan Perón became persona non grata, it was Evita who travelled to Spain, Italy and the rest of the Europe (but shunning the UK when the Queen would not personally meet with her), spreading the kind of PR reserved for American movie stars and paving the way for Argentina to secure badly needed loans. All the while handing out coins and bills to the poor. She was called the ‘South American Eleanor Roosevelt’ only Eleanor Roosevelt didn’t travel with a separate DC3 for her luggage. Or have 25,000 well-wishers standing outside her hospital for close to a year, or a million and a half citizens trooping in from every part of the country to show their respect as death approached. The letters back and forth from Eva to her husband during the European trip were the stuff of romance. She clearly loved the man who arrested and imprisoned his enemies and who allegedly had a predilection for young girls—warts and all. She delivered the ‘shirtless ones’, the workers who were the backbone of the Peronist Party, with huge, dramatically-staged gatherings that preceded the 1946 elections and saved her husband from defeat. And again in 1951, now bringing along half a million female votes as well, in the new age of women’s suffrage, despite being unable to stand (and often unable to speak), afflicted with the cancer that would take her life in 1952. Contradictions: the woman who hosted Argentina’s politicos and her husband’s powerful associates at their home in her pajamas when she couldn’t be bothered to put on one of her many ‘scandalous’ gowns, who would offer to ‘open a few tins’ if they suggested dinner, was the same woman who worked tirelessly at her foundation all day, every day, until she was confined to a hospital bed. 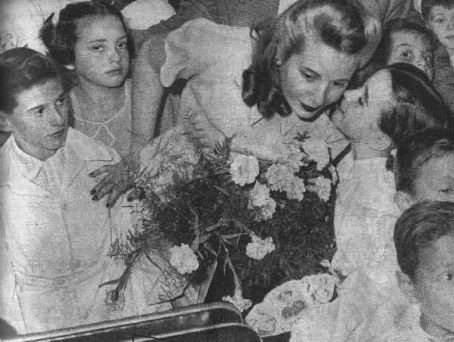 And once Eva was gone, in spite of being embalmed in a glass-topped coffin that millions of followers would file by and reverently touch, Juan Perón’s magic too vanished. By 1955 he was exiled in a military coup after his country fell into financial ruin. 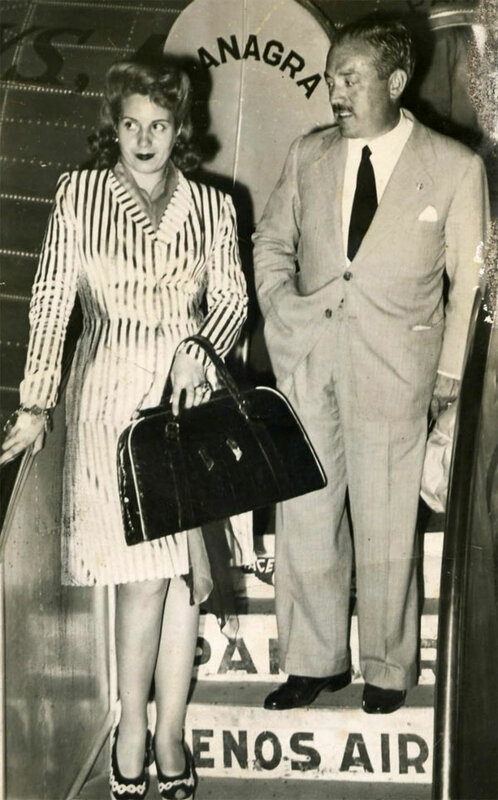 Coincidence perhaps, but Perón’s enemies understood the power of Eva’s ghoulishly preserved eighty pound corpse, and went to great lengths to conceal it after her husband’s fall. That’s another story, of how Eva’s body was rediscovered many years later in a grave in Milan under the name ‘Maria Maggi’. 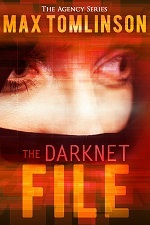 Her enemies needed to get rid of her image but were afraid of destroying her body. She held that much power — even in death. 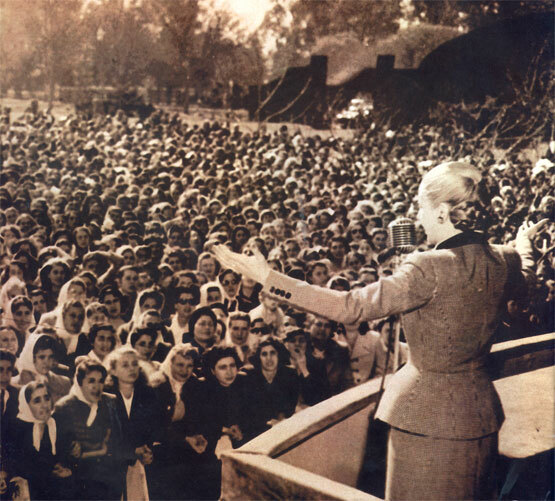 Had she lived, Eva Perón would have eventually been elected President of Argentina. She had already been put forward for vice president at a time when women went to the beauty parlor. 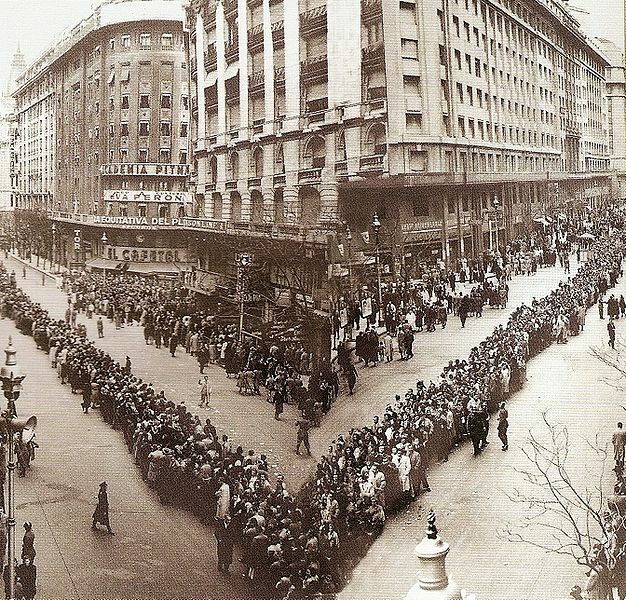 Eva was brought back from Italy to Argentina to lie in state in the Recoleta Cemetery in Buenos Aires (called the most exclusive neighborhood in Latin America). Anyone visiting today will continue to see a line of people at her crypt. The cult of Eva? Without a doubt. But an Argentine associate of mine tells me of his parents, who read Eva’s inspirational quotes in their school textbooks as children, and still feel a sense of pride in the woman who put their country on the twentieth century world map. How many women who once lived in a single room with their mother and four siblings, who worked as a child in the kitchens of the estancias, helping their family scrape by, end up being played by Madonna in films named after them? This entry was posted on April 30, 2013 by Max Tomlinson. It was filed under Argentina, book reviews, Latin America and was tagged with Argentina, Argentina history, Buenos Aires, Eva, Eva Peron, Evita, Juan Perón, Recoleta.